Fast-moving, fast-talking chef José Andrés combines Spanish and American flavors for a Christmas feast featuring a stellar sausage-stuffed rack of pork. José Andrés isn’t happy. His friends are arriving within the hour for Christmas lunch, but there’s something wrong with the herb-coated rack of pork. It’s not the stuffing: a sweet-salty mixture of brandy-soaked prunes and apricots combined with butifarra, the plump, juicy Spanish pork sausage. And it’s not the pork, perfectly browned and moist. It’s the balance of the dish—the balance of cultures, that is. It doesn’t seem Spanish enough. Andrés sees a kumquat garnish and that reminds him of clementines, the juicy, thin-skinned citrus fruit that Spanish growers have perfected. He adores them: "So easy to peel, so juicy, so sweet—not as acidic as orange and tasting a little of apricot." He adds clementine zest to the pan and is finally ready to relax. As a Spanish chef who has worked in the United States for the past 15 years, Andrés often seems torn between the Old World and the New. 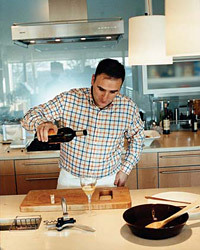 Is he staying true to the traditions of Spain, or creating something distinctly modern in the U.S.? Each month he divides his time between Washington, DC, where he runs seven successful restaurants, and Madrid, where he’s the star of his own TV cooking show. His restaurants cover an even broader range of styles—from his tapas at Jaleo to his avant-garde dishes at Minibar. In America, Andrés has become the most energetic advocate for the Spanish revolution in cooking; his mentor is the extraordinary innovator Ferran Adrià at El Bulli. In Spain, he’s simply the kid from the humble region of Asturias who made it big. That energy has led to a James Beard award, critical acclaim and a cookbook, Tapas: A Taste of Spain in America, which I co-wrote. But even as a book author, Andrés could never sit still. When we were writing Tapas together, he would often jump out of his seat and dash to the stove. I initially thought he was reminding himself of the recipe we were writing. I was wrong. He would often cook a pasta dish just to keep his hands, and his mind, busy. Bridging the gap between a Spanish and an American Christmas, says Andrés, is a challenge. When he was growing up in Spain, his family would sometimes eat turkey for Christmas, as Americans often do; at other times they ate snapper. Unlike in America, Christmas Day is a lesser event than Christmas Eve. In some parts of Spain, even Santa Claus, beloved in the United States, is a fairly recent addition to the holiday. But to Andrés’s little daughters Carlota and Ines, who skip effortlessly between Spanish and English, a hybrid celebration seems delightfully normal. As their baby sister, Lucia, takes an afternoon nap, the girls dip their fingers in the saffron-infused vinaigrette for their father’s citrus salad. Before anyone notices, they put their hands in a bowl of mashed potatoes creamed with Manchego cheese and olive oil, and dab their noses with little white blobs. This year’s Christmas lunch is at the stunning home of Olvia Demetriou and Theo Adamstein, of the DC firm Adamstein & Demetriou, who designed Andrés’s Mediterranean-style restaurant, Zaytinya. From the outside, their house looks like a small bungalow—it’s an original 1920s Sears home. But Demetriou and Adamstein more than doubled their space with a modern, split-level addition that opens up to a view of Washington stretching to the Potomac River in the distance. The group is joined by Andrés’s restaurant partner, Rob Wilder, Wilder’s wife, Robin, and their two children. Andrés begins by mixing cocktails made with his favorite cava and fresh pomegranate juice, a distinctly Spanish take on a Kir Royale. A lovely tapas spread includes zesty green olives stuffed with peppers, almonds and anchovies, and a riff on a traditional Basque dish called txangurro, transformed into bite-size rectangles of store-bought puff pastry topped with Maryland crab, onions and peppers. "My father would make this with spider crabs," Andrés recalls, "but sometimes we wouldn’t make anything because we’d just eat the crabs as we cleaned them." To follow the tapas, Andrés re-creates a Catalan dish called rossejat de fideos—toasted angel hair pasta cooked slowly (like paella) in fish stock and topped with Maine lobster. Then the main course: herb-coated pork, perfected with Andrés’s beloved clementines. Still, it’s the dessert that Andrés is most proud of: a Spanish custard with candied pecans that he calls, cheekily, his "pecan pie." His starting point was the southern Spanish dessert called tocino de cielo, roughly translated as "fat from heaven." The recipe is traditionally made with sugar, but Andrés has substituted maple syrup. He takes a spoonful. "This is so amazing it scares me," he proclaims. "Spanish cooking is all about fusion. Now we’re ’fusionizing’ Spanish cooking right here in the heart of America." For a moment, even Andrés forgets whether the dish is too Spanish or too American. It just tastes too good. Richard Wolffe is the senior White House correspondent for Newsweek and the co-author, with José Andrés, of Tapas: A Taste of Spain in America.